I stumbled across this recipe for chocolate cake on pinterest. Apparently, this is a copycat recipe from a restaurant in Utah that makes a well-known chocolate cake. I was interested in the recipe because of the ingredients (salted butter, brown sugar, sour cream) and the process (blooming the chocolate). The cake was good, though it was not as moist as I would have thought given some of the ingredients (although I may have slightly over-baked it). The frosting raised the cake to another level, though, because of the salted butter, the added salt, and the heavy cream. 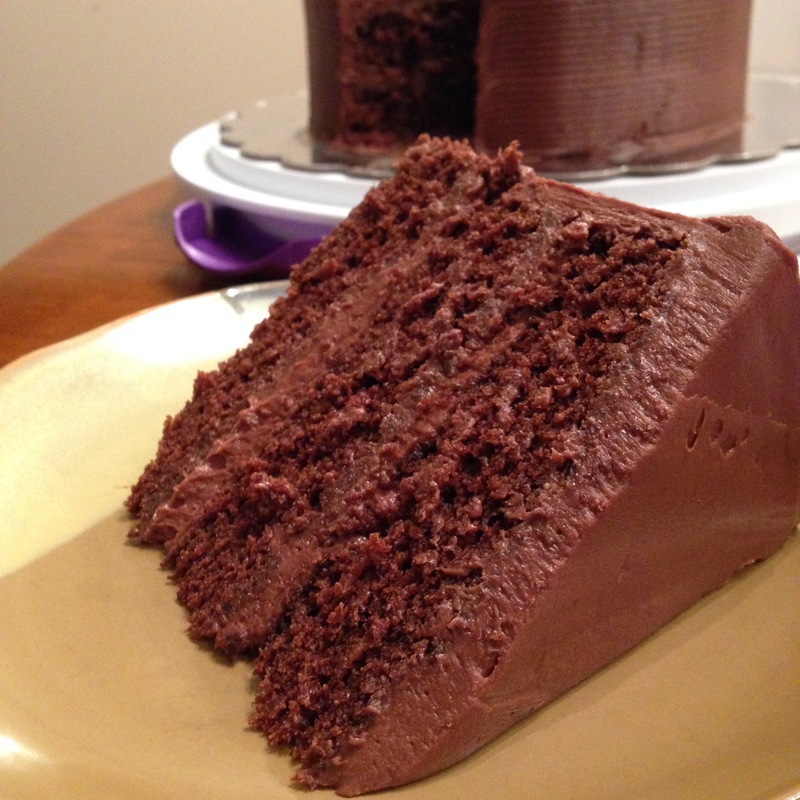 The salted chocolate frosting was velvety, addicting, and made the cake more moist over the next few days. Everyone really liked the cake, some remarking that it was the best chocolate cake that I have made. I’m not convinced that this is the ultimate chocolate cake for which I’ve been searching, but it is very good. You’ll also notice that I attempted some texture work with the frosting using a sculpting triangle that I bought recently. It wasn’t perfect, but it added an aesthetic element to the cake that was lacking. For the cake: Preheat oven to 325 degrees. Line three 8″ cake pans with parchment paper, then butter and flour the pans. Add butter, water, and cocoa to a small saucepan over medium heat until well mixed. Bring to boil for about 30 seconds, then remove from heat and let cool. In a medium bowl, whisk together sugar, flour, and salt. Set aside. In a small bowl, whisk eggs while sprinkling baking powder and baking soda on top. Once fully incorporated, add the vanilla and dark brown sugar, whisking to combine. In a large bowl, stir the chocolate mixture into the flour mixture until incorporated, then add the egg mixture and fold in the sour cream. Divide the batter between the three pans (~253 g each), then bake for 34-40 minutes or until toothpick inserted into center comes out clean. For the frosting: In a stand mixer, cream the butter well on high speed. Alternately, add the cocoa and powdered sugar in increments with the heavy cream in between and beating after each addition until incorporated. Add the salt and vanilla, mixing to incorporate.